Well, here we are….the 2nd day of Fall! Can you believe it’s already here? I can’t. This past summer was a blur and now the leaves are turning all shades of beautiful! When I saw the photos for this guest post today by Melissa at No. 2 Pencil, the first thing I thought of was what a perfect recipe for this time of year! It’s got all the beautiful reds, yellows and greens of fall and it’s great comfort food! 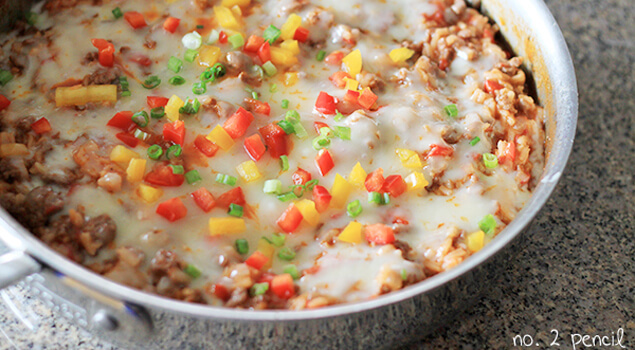 If that weren’t good enough…it’s also naturally gluten-free AND you make it all in one pan! I personally can’t wait to try it! Please welcome Melissa……………..
Hello One Good Thing readers! I’m Melissa from No. 2 Pencil and I’m so thrilled to be here with you today. Over at No. 2 Pencil, I share my favorite recipes, crafts and DIY projects. I’m really excited to share my latest one-pan recipe with you, One Pan Unstuffed Bell Peppers. It is unbelievably tasty, and everything cooks in the same skillet. Even the rice! These have all the incredible flavor of traditional stuffed bell peppers, but the prep and clean up is a snap. If your family loves stuffed bell peppers, they are going to love these Unstuffed Bell Peppers. My One-Pan Chicken Alfredo and One-Pan Cheeseburger Casserole are a few of my most popular one pan recipes, and this dish is right up there with them! Let me show you how easy it is to make. Start by dicing two cloves of garlic, 1/2 of a medium onion, and two bell peppers. Saute in two tablespoons of olive oil. Once the peppers and onions have started to soften, add one pound of extra lean ground beef to the pan. Season with one teaspoon of salt and several turns of freshly ground pepper. When the ground beef is cooked, add one can of low-sodium chicken broth, one 14.5 oz can of whole tomatoes, one 8 oz can of tomato sauce, and one teaspoon of soy sauce. I prefer canned whole tomatoes over canned diced tomatoes for a fresher taste. I just use my kitchen scissors to chop up the whole tomatoes while they are still in the can, then pour them into the pan. Bring the tomato mixture up to a simmer, then stir in one cup of uncooked extra long grain rice. Cover the pan with a lid and reduce the heat down to low. Let mixture cook 20-30 minutes covered, or until rice is tender. At the 20 minute mark, open the pan every five minutes and stir so the rice doesn’t stick to the bottom. You can stop here if you prefer not to use cheese. The flavor is so good, and the consistency is similar to Jambalaya. I topped ours with a cup of freshly shredded jack cheese. I love jack cheese because it just melts into the dish. So yummy! I covered the pan with the lid to let the cheese melt, then sprinkled a little bit of diced, fresh bell peppers and green onions. It was divine, seriously one of my favorite dishes I have ever made. The ground beef and rice are so tender, and the flavor from the onions, bell peppers and tomatoes are one of my favorite combinations. The teaspoon of soy sauce adds to the meaty, rich flavors of the dish. You can’t really identify it in the recipe, it just adds another level of flavor that really compliments the dish. You may also want to try my Slow Cooker Stuffed Bell Peppers. You don’t have to precook the ground beef, so the prep is incredibly easy as well. This recipe is easily lightened up. Try substituting ground turkey for ground beef. You can also use reduced-fat cheese, or just skip the cheese altogether! If you enjoyed this recipe, I’d love for you to pop over and say hello. Thank you so much for letting me share, Jill! Start by dicing two cloves of garlic, 1/2 of a medium onion, and two bell peppers. Reserve some of the diced bell peppers to sprinkle on top. Saute peppers, onions and garlic in two tablespoons of olive oil over medium heat. Once the peppers and onions have started to soften, increase heat to medium high and add one pound of extra lean ground beef to the pan. Season with one teaspoon of kosher salt and several turns of fresh pepper. Once the ground beef is cooked, add chicken broth, the can of whole tomatoes (chopped), tomato sauce, and soy sauce. Bring the tomato mixture up to a simmer, then stir in one cup of uncooked extra long grain rice. Cover the pan with a lid and reduce the heat down to low. Let mixture cook 20-30 minutes, or until rice is tender. At the 20 minute mark, start stirring the pan occasionally so the rice does not stick to the bottom of the pan. One rice is tender, sprinkle the cheese on top. Cover the pan with the lid to let the cheese melt. Garnish with fresh diced bell peppers and green onions. Super Easy Slow Cooker Dinners for Super Busy Weeks! How To Make Mini Taco Bowls In Minutes! Convenient and delicious, thank you! New to your website! I was wondering if I could do this in the slow cooker and do I need to cook the meat? What a great recipe !! I didnt have the usual one bell pepper per person, so this was the perfect thing to prepare. Do you think I could substitute tofu or tempe for the beef for a meatless option? I’m thinking about trying it just to see. I made this tonight with Quorn crumbles (vegetarian soy-free ground beef) and it was delicious!!! I also added a can of black beans (rinsed and drained) and about a cup of frozen corn. Will definitely make again!!! My 2 year old loved it too!